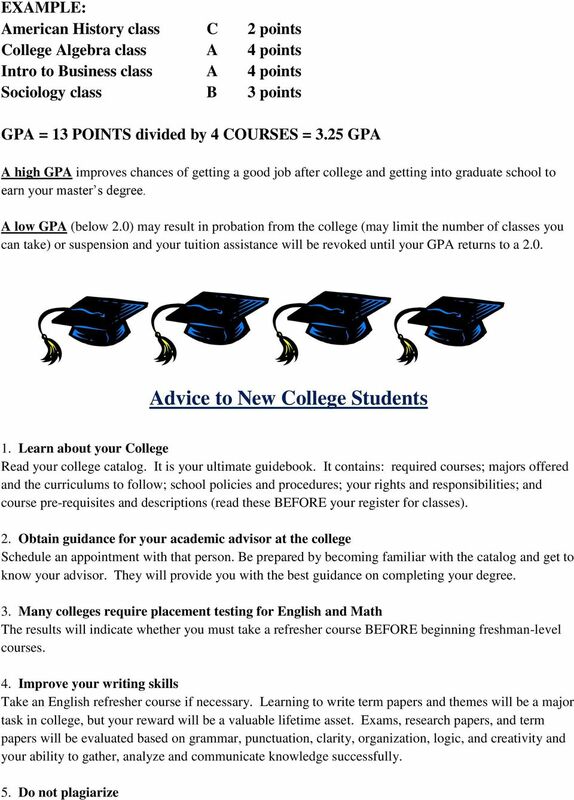 Download "I Don t Know a Thing about Going to College! 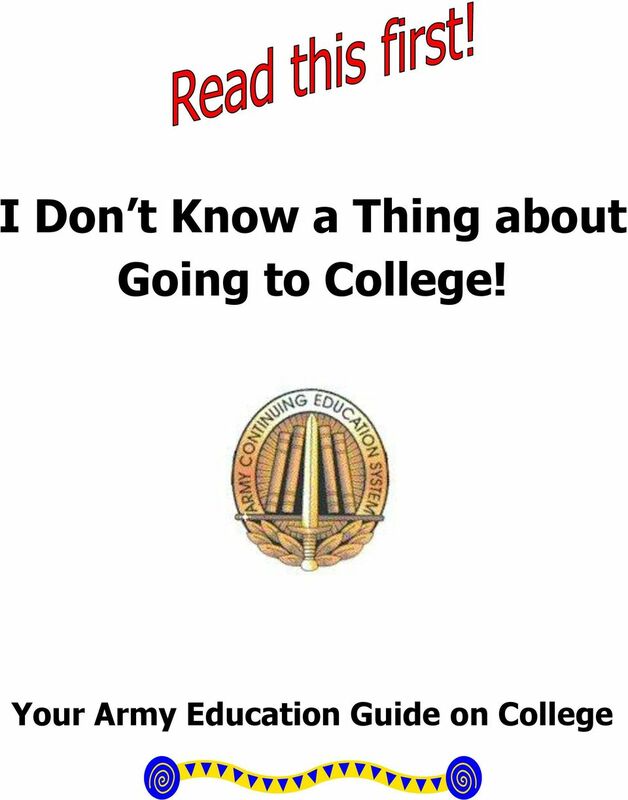 Your Army Education Guide on College"
2 THINGS TO KNOW AND ASK ABOUT Keep it simple You may want to complete a Bachelors degree in something, but you are here at Fort Drum, so start with local colleges that offer associate degrees (half of a bachelor s degree) and the classes are either classroom instruction or online. 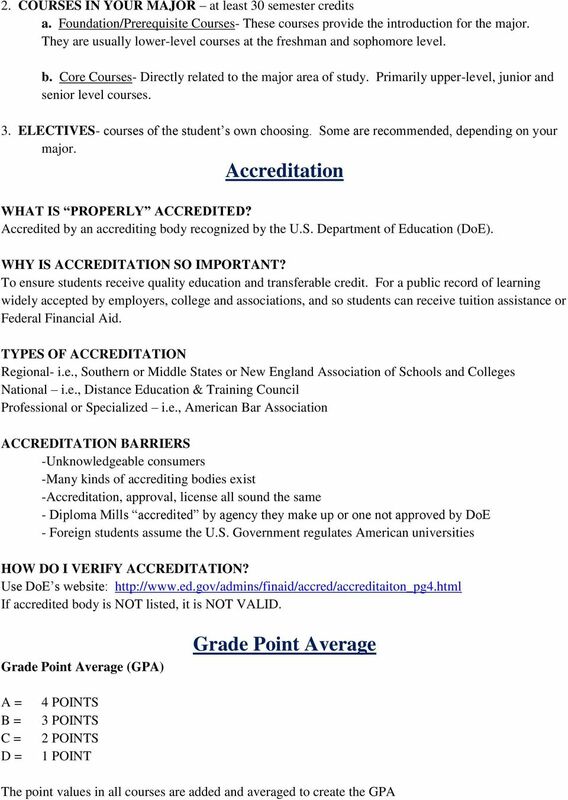 Ask questions and questions to think about What is the college s accreditation? What is a degree plan and does the college offer the one you want? How best do you learn? Do you need face-to-face instruction or are you disciplined enough to handle online? What does it cost? What is the cost of tuition? How much are books? What are the fees? Does the Army help pay the costs? Can I apply for financial aid to help me pay the extra costs? Refresher classes I am not up to speed in Math or English. It has been years since I was in school. What will the college do to help me? Do they offer placement testing to help me find the right class for my skills? What are college classes like? Read everything you receive from your college and instructor. Read the college catalog. It will explain the degrees and class descriptions, provide clarification on policy and other rules and responsibilities. 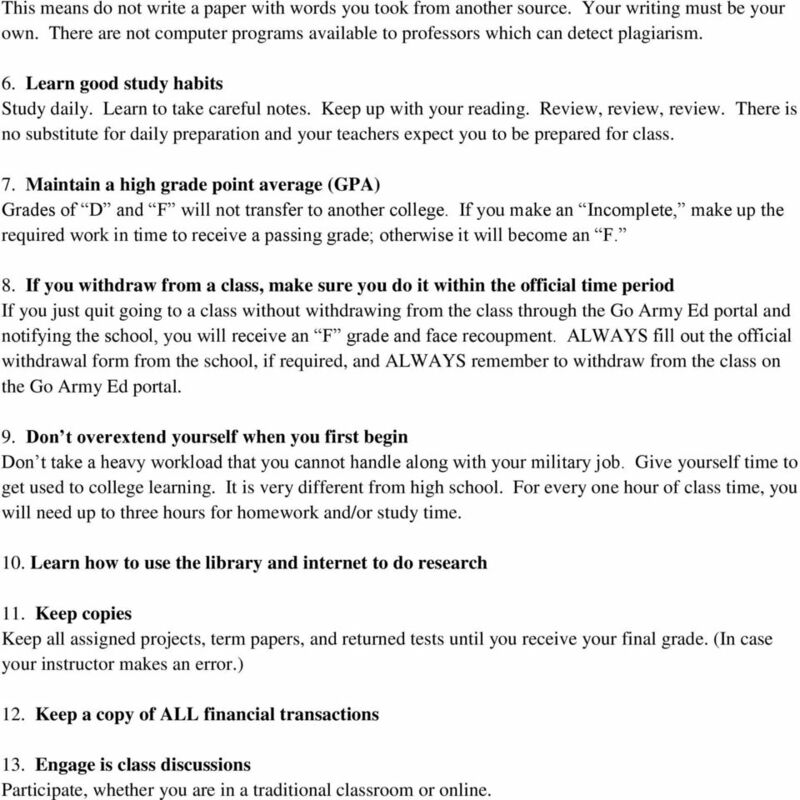 The class syllabus will show you everything you will need to do for the class. Study daily. Take careful notes. Keep up with your reading and homework. You are responsible for turning in all assignments even when you are in the field, out sick, or TDY somewhere. Most Common Degrees ASSOCIATE DEGREE: a two-year course of study (generally semester hours of credit). This means you must take about 20 classes, resulting in an Associate of Arts (A.A.), an Associate of Science, (A.S.), or an Associate of Applied Science (A.A.S.). An A.A.S. is considered a terminal or careeroriented degree, and is not meant to transfer to a 4-year college or university (you plan to go to school and then seek employment). 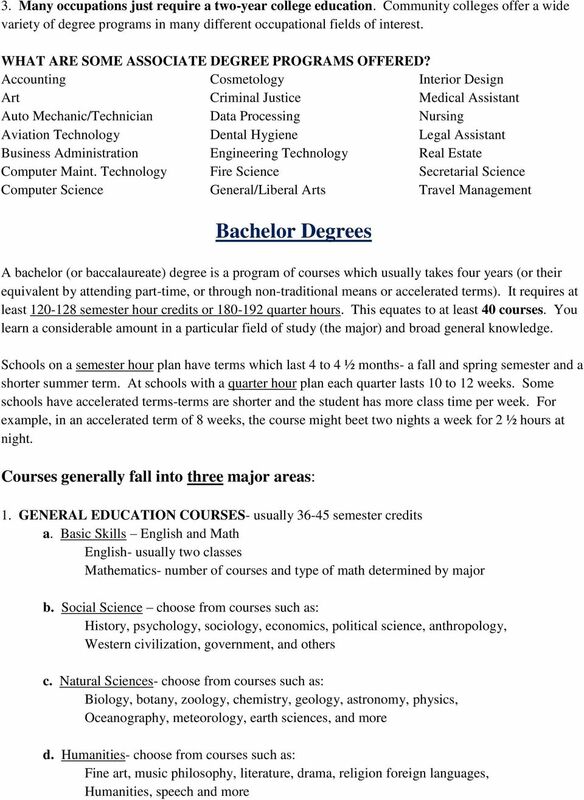 BACHELOR S DEGREE: a four-year course of study that results in either a Bachelor of Arts (B.A.) or a Bachelor of Science (B.S.). It is also called a baccalaureate degree. It generally consists of semester hours of credit or a quarter-hour equivalent. This means you must take about 40 classes. MASTER S DEGREE: a one to two-year course of study usually semester hours beyond the bachelor s degree. It usually results in a Master of Arts (M.A.) or a Master of Science, (M.S.). There are many variations as well, such as the Master of Business Administration, (M.B.A.) and the Master of Fine Arts (M.F.A.). Your master s degree may or may not require a thesis. 3 DOCTORATE DEGREE: This is the highest academic award a student can earn for graduate study. It usually results in a Ph.D. (Doctor of Philosophy) in a particular academic field. For example, you could earn a Ph.D. in math, history, engineering or public administration. Those who earn a doctorate in education are awarded an Ed.D. (Doctor in Education) All doctorate degrees require three or more years of graduate work ( semester hours) beyond a master s degree and completion of a dissertation approved by faculty committee. PROFESSIONAL DEGREE: This degree is specific to a certain profession, such as medicine, law, pharmacy, optometry, theology, and veterinary medicine, to name a few. It requires (1) completion of academic requirements to begin practice in a profession, (2) at least two years of college work prior to entering the program, and (3) a total of at least six academic years of college work to complete the degree program, including prior college work plus the length of the professional program itself. 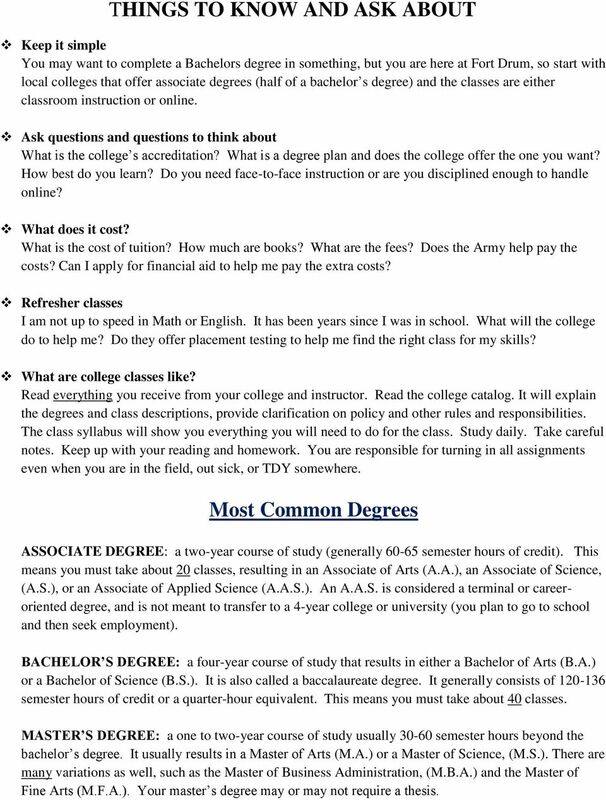 Associate Degrees WHAT IS AN ASSOCIATE DEGREE? It is a program of courses which usually takes two years to complete (or their equivalent if attending part-time or through non-traditional means or accelerated terms.) It consists of semester credits or quarter credits, depending on what type of term the college uses. This equates to about 20 courses. Most associate degrees are earned at a community or junior college. There are more than 1,260 community colleges in the United States. 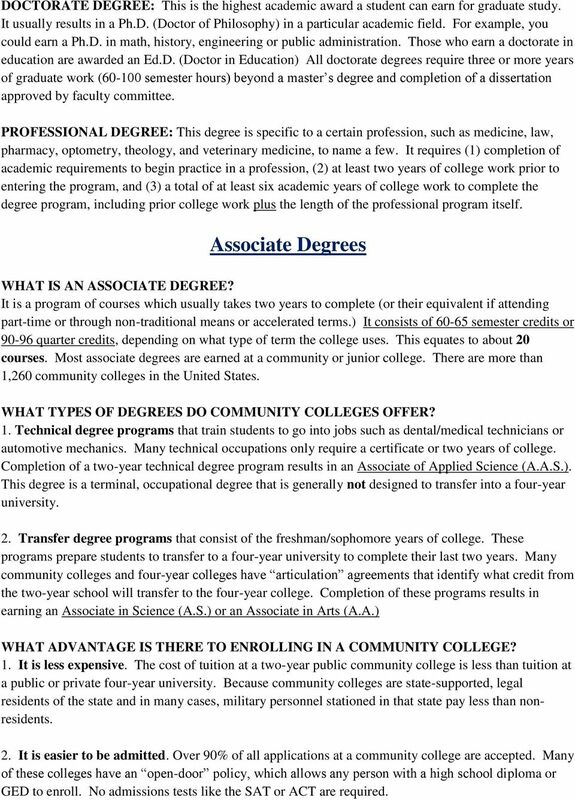 WHAT TYPES OF DEGREES DO COMMUNITY COLLEGES OFFER? 1. Technical degree programs that train students to go into jobs such as dental/medical technicians or automotive mechanics. Many technical occupations only require a certificate or two years of college. Completion of a two-year technical degree program results in an Associate of Applied Science (A.A.S.). This degree is a terminal, occupational degree that is generally not designed to transfer into a four-year university. 2. Transfer degree programs that consist of the freshman/sophomore years of college. These programs prepare students to transfer to a four-year university to complete their last two years. Many community colleges and four-year colleges have articulation agreements that identify what credit from the two-year school will transfer to the four-year college. Completion of these programs results in earning an Associate in Science (A.S.) or an Associate in Arts (A.A.) WHAT ADVANTAGE IS THERE TO ENROLLING IN A COMMUNITY COLLEGE? 1. It is less expensive. The cost of tuition at a two-year public community college is less than tuition at a public or private four-year university. Because community colleges are state-supported, legal residents of the state and in many cases, military personnel stationed in that state pay less than nonresidents. 2. It is easier to be admitted. Over 90% of all applications at a community college are accepted. Many of these colleges have an open-door policy, which allows any person with a high school diploma or GED to enroll. No admissions tests like the SAT or ACT are required. 7 This means do not write a paper with words you took from another source. Your writing must be your own. There are not computer programs available to professors which can detect plagiarism. 6. Learn good study habits Study daily. Learn to take careful notes. Keep up with your reading. Review, review, review. There is no substitute for daily preparation and your teachers expect you to be prepared for class. 7. Maintain a high grade point average (GPA) Grades of D and F will not transfer to another college. If you make an Incomplete, make up the required work in time to receive a passing grade; otherwise it will become an F. 8. If you withdraw from a class, make sure you do it within the official time period If you just quit going to a class without withdrawing from the class through the Go Army Ed portal and notifying the school, you will receive an F grade and face recoupment. ALWAYS fill out the official withdrawal form from the school, if required, and ALWAYS remember to withdraw from the class on the Go Army Ed portal. 9. Don t overextend yourself when you first begin Don t take a heavy workload that you cannot handle along with your military job. Give yourself time to get used to college learning. It is very different from high school. For every one hour of class time, you will need up to three hours for homework and/or study time. 10. Learn how to use the library and internet to do research 11. Keep copies Keep all assigned projects, term papers, and returned tests until you receive your final grade. (In case your instructor makes an error.) 12. Keep a copy of ALL financial transactions 13. Engage is class discussions Participate, whether you are in a traditional classroom or online. General Information. Scholarships. Pre-Admit Status. Pre-professional Studies. ETAS, Room 125 (501) 569-3247 fax (501) 569-8017 ualr. A TRANSFER ARTICULATION AGREEMENT BETWEEN JAMESTOWN COMMUNITY COLLEGE AND DAEMEN COLLEGE This agreement establishes guaranteed admission for students from Jamestown Community College (JCC) to Daemen College. Glossary for ASPIRE Advisors, Students and Families Academic Records Academic information kept on file by the school. This record includes a transcript of grades, test scores, and related academic materials. An academic adviser is a member of the college who helps and advises a student solely on academic matters. A Level Two certificate program consists of at least 43 and not more than 59 semester credit hours. Page 48 Graduation & General Degree Requirements Level One Certificate 1. Satisfy all admission requirements to the college. 2. Satisfy all admission requirements specific to the program (if applicable).